Submitted by Evelyn Kiefer on Tue, 07/15/2008 - 23:47. 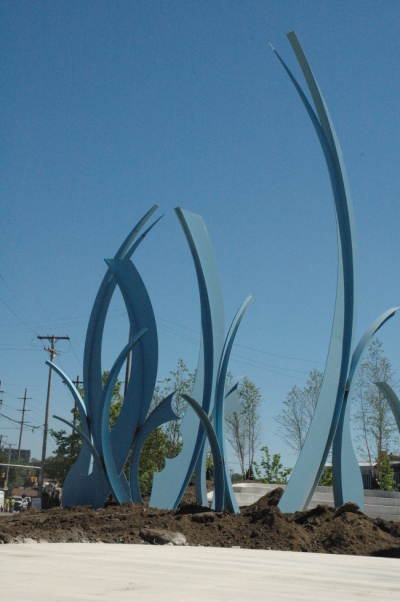 The Mildred Andrews Putnam Sculpture Park by Richard Fleischman is the newest work in the Putnam Sculpture Collection. The blue steel elements (almost Wedgewood Blue) rise out of the soil like monumental blades of some exotic grass and stand 40 feet tall. The installation also includes an elegant line of birch trees, a sculptural concrete seating/theater area and path and artistic lighting. The park is intended for the use of Case Western Reserve University and the surrounding community. A beautiful place for people to study, play or gather, it is located at a strategic gateway to University Circle and an exciting site of reinvestment and development. Few people even noticed the unceremonious ground breaking at East 118th Street and Euclid Avenue last fall, but it was an important event in a public art project that was three years in the making. The Mildred Andrews Putnam Sculpture Park was an unusual opportunity for architect Richard Fleischman of Richard Fleischman + Architects, Inc., to create something that is purely sculptural. Fleischman considers himself an artist and as a life long Clevelander, he fits the Putnam Sculpture Collection's definition of regional artist. The Mildred Andrews Putnam Sculpture Park is a superb edition to the Putnam Collection, which already includes a sculpture garden by a renowned architect, Philip Johnson. Few sculpture collections in the world can boast such exceptional examples of sculpture designed by world class architects. Details about the fall dedication ceremony and reception for the Mildred Andrews Putnam Sculpture park soon to follow.